Well, finally! Jhudora thought grimly as the faerie Kougra promptly walked up to the faerie, a smug smile and an evil twinkle in her eyes. "Well?" Jhudora snapped, folding her arms and glaring at the Kougra. "Oh, I, um...got really thirsty on the way..." the faerie Kougra replied, licking a paw innocently. Jhudora raised her eyebrows. "You didn't?" she said. The faerie Kougra nodded and grinned. "You blundering idiot!" Jhudora screeched, flopping down on her throne. "When I said fetch me a Tropical Fruit Smoothie, I didn't mean fetch me a Tropical Fruit Smoothie and DRINK IT BY THE TIME YOU GET BACK HERE!!!" "Oh, I'm soooo sorry," the Kougra replied, still grinning. "What? Illusen told me not to work for you, so I followed her orders. I know how much you loathe her." Jhudora raised a finger. A bolt of lightning struck down on the faerie Kougra, but to Jhudora's chagrin the Kougra merely laughed as the lightning deflected off her and back at Jhudora, frying her hair. Jhudora coughed. "What in Neopia is the matter with you?" she gasped, clenching her fists and gritting her fangs. "Have you no fear of me, Darkest Faerie of Neopia?!" The faerie Kougra snarled. "You are like the rest of the cowar-...Darkness Faeries. You go around boasting about your sense of pride, thinking that you're the best. Don't you fear the REAL Darkest Faerie?" At that Jhudora stopped screaming. Her eyes flashed a furious red, and at the Kougra she blew a sparkly green fire. The Kougra's eyes widened and grasped dear breath as the squeezing flames engulfed her. "I don't get it," Jhudora said. "You don't have a weakness." She waved her hand, and the flames slowly released the faerie Kougra, who let out a long gasp. "Who are you? And what are you talking about? I'm the Darkest Faerie in all of Neopia, got that?" "Oh, really?" the Kougra retorted, and Jhudora didn't notice the evil gleam in it's hidden yellow and red eyes. "What about...that statue of Maraqua? Who's she?" Jhudora nibbled on a nail. "That would be...the Darkest Faerie," she grimly admitted, and sat down cross-legged on her cloud. She twirled a claw around the cloud, causing the green gases to steam out. "I knew her very well, and how powerful her greed was." "Gee, you must really hate her!" the Kougra said, looking at Jhudora with wide eyes. "Yes...even more than that faerie Illusen." "Yes." And Jhudora fought back the sadness in her that fought to show itself to the mere Neopet. "Long, long ago there was a faerie. A Darkness Faerie, one so powerful, so vile, merciless and deadly all type of faeries called her the Darkest Faerie. Besides, no one dare speak her true name." She frowned. "It's forbidden." "Well, I heard rumors that it's forbidden because saying it will make you cursed!" the Kougra exclaimed. "Yes, I'm sure you've heard of the story already. She claimed one world, and her greed had grown uncontrollable she marched over to Faerieland to try and claim our world. Without Faerieland and Fyora, Neopia would be in grave danger." "So...this Aisha sorcerer from this other world wove a magical Orb of Faerie Magic. The Aisha was called Jerdana, and she gave the Orb to Fyora. It was almost too late, but the Faerie Queen managed to imprison the Darkest Faerie into a hard, stone shell. Then she banished her to the deep depths of Maraqua, and soon she was slightly forgotten." The Kougra was not satisfied, and pulled out her ace. "IF she is forgotten, then how come you still remember her?" Jhudora growled at the Faerie Kougra. "You're too nosy," she hissed. "Tell me, NOW," the fearless Neopet responded sharply, her face a stone cold ferocious glare. Jhudora winced, and continued. "I can't believe I'm telling this to some worthless Neopet! Alright. The Darkest Faerie knew me since the day I was born. She was my teacher on Black Magic. Back then I had great agility, powerful magic, and the mischief of a young fire faerie. Then this witch scolded me for 'not acting as a proper Darkness Faerie!' Pah!" "I noticed that the Darkest Faerie was deep into thinking everyday. She wanted to be Faerie Queen. I wouldn't allow her, because I too wanted the throne. We argued for years and years and years. Soon my magic overruled hers, and I finally had the courage and strength to face her-"
"The courage?" the Kougra interrupted. When Jhudora nodded, the Kougra smirked. "But she had grown more powerful then since I last saw her. She had stolen magic from the best wizards, magi and faeries from Neopia. Then she tried that spell...that horrible nightmare spell..." Tears welled in Jhudora's eyes and she whimpered. The faerie Kougra looked stunned, for real. Jhudora, crying?! "Then what?!" "I wanted to tell Fyora about what she planned to do," Jhudora whispered, the tears falling silently. "but she held me in a nightmare. I saw what would happen, Fyora would banish her, then she'd come back with a vengeance...but I saw too much. I couldn't survive it and almost was banished myself! Finally I had to turn myself into a Bartamus. When I arrived at the battle scene, Fyora and this light faerie..."
"Siyana," the Kougra snapped. Jhudora noted the hate she heard when the Neopet spoke that name, and continued on. "And some other faeries were waging war against each other. I tried to help, but she took me down first and trapped me inside a bottle! While I was watching, the Aisha, Jerdana, gave this beautiful artifact of sparkling gold and ruby with the power of all faerie magic in it. It was so powerful, yet Fyora was weak, so the artifact could only use a portion of it's magic, it only turned the powerful witch into a hard stone statue, which she sunk in the depths of Maraqua." The faerie Kougra was listening intently to these words, but she still hadn't heard enough. "So, why do you collect all these little items and trinkets?" "I collect them for my potions and magic hexes," Jhudora exclaimed, her eyes dry now. She squeezed a flower into a bottle of the green liquid from the cloud, and nectar flowed with the gaseous liquid. She corked it. "If you're such a bad faerie, why don't you just punish the ones that complete the quest?" the Kougra said, swirling a claw in the green liquid. Her eyes flew wide open as she looked in the pool, and quickly batted a paw at the pool. 'It's nothing!" the Kougra nervously chuckled, and Jhudora cocked her head in confusion. Some Bartamus were hissing at the faerie Kougra now. "Be quiet!" she hissed, and swatted one with her wing. "Somehow every living creature seems to dislike you," Jhudora muttered as she arranged some of her Shrooms. "Gee, I wonder why," the Neopet returned, continuously being pestered by the Bartamus. "What I like to laugh about the Darkest Faerie is her three true sisters," Jhudora grinned. "They are pretty lethal and quick, though they care more about shopping for clothing." She started to chuckle. Her scowling face returned. "I still hate those other Faeries, ESPECIALLY the Darkest Faerie and Illusen!" "What do you reckon the Darkest Faerie will do after the one thousand years banishment?" the Kougra asked. "I think she'll smash that helpless object into one thousand pieces, so it's magic wouldn't imprison her anymore!" Jhudora rubbed her chin in thought. "The Darkest Faerie is complete Darkness. I don't think she'd do that. She'd use a counter spell to alter the banishment, and the Orb would be still in one piece. Although she could think, she is slightly not as intelligent as I am, since her mind thinks fast and accepts the first plan in her mind. She would probably take Jerdana's Orb and use it's full magic on Fyora." Jhudora shuddered uncomfortably. "Her magic's really powerful. She swapped her slow agility with mine, therefore I can't move that fast. She's not that strong, though; she relies on magic too much. Darkness Faeries have plenty of black magic, but some of us talented and swift faeries have certain power." Jhudora flexed her claw at the acid cloud. Instantly pointy vines grew and coiled around the Faerie Kougra. "I have an element of earth, courtesy of drinking Illusen's potion," she smirked. The Faerie Kougra grinned evilly. "Thank you for your cooperation, dear Jhudora," she said slyly, and suddenly the vines wilted to the ground and turned to Dark hissing Wadjets. Jhudora raised an eyebrow and snapped the Dark Wadjets away, suspicious now. "Only faeries have that magic," she spoke sharply, her tone cracking. "Darkness Faeries. How did you do that?" 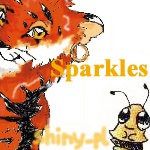 The Neopet giggled, and snarled, its eyes a flashing yellow red now. "You told me everything. Now I have all that I need," she snapped, her voice no longer childish but like sharp piercing daggers. Instantly the Kougra morphed into a Darkness Faerie of blue, gray and black. A skeleton staff appeared and she snatched it in a quick movement. Her dark periwinkle streaked hair flew as thunder and lightning boomed over Faerieland. Jhudora gasped and stepped back. "Maybe you were right," the Darkest Faerie smiled, and extended a palm. From it dangled a beautiful trinket of gold and ruby. "I would trap someone into stone, and use, as you said, it's full magic. You've seen and heard too much, so I think I know who to turn into dust first!" "Not without a fight!" Jhudora snarled menacingly, and extended her claws. She leapt high and charged at her teacher, but the Faerie whacked Jhudora on the wings with her staff. Jhudora winced as she crashed to the cloudy floor. "Like all those cowards, you think you're so great," the Darkest Faerie scowled, placing a foot on Jhudora's back. "You think you're numero uno on the Darkness Faerie's list. Guess what? You're only second going to last!" Just then a nearby air faerie had spotted Jhudora and the Darkest Faerie. "Merciful White Weewoos!" she gasped, and was gone in a flash. The Darkest Faerie cursed her bad fortune, and turned to the horridly scared Faerie. "Tell Fyora," the Darkest Faerie warned. "Tell her and you'll gravely suffer the punishments I await for you." And she vanished. Jhudora gasped and sat up, her heart beating faster than the wings of an Airax. It couldn't be a thousand years yet! She had to tell Fyora. She had to. She knew she was first on the doomed list, but she had no choice. Then her mind snapped to the malicious witch she was. "We'll see, teacher," she hissed. "You taught me everything there is to be a powerful Darkness Faerie, and now you're gonna regret it...once I claim MY position back as DARKEST FAERIE!"